The Neighborhood Academy in Prinzessinnengarten is a self-organized open platform for urban and rural knowledge sharing, cultural practice and activism. Dignity / Dignidad is a film by Michelle Teran about strategies of recuperation in times of crisis. Recuperation, in a literal sense, means the recovery or regaining of something. The film focuses on “La Dignidad”, an apartment building in Mosteles, a suburb of Madrid. The building was constructed during the real-estate boom, but never occupied after the property market collapsed following the Spanish financial crisis starting in 2008. 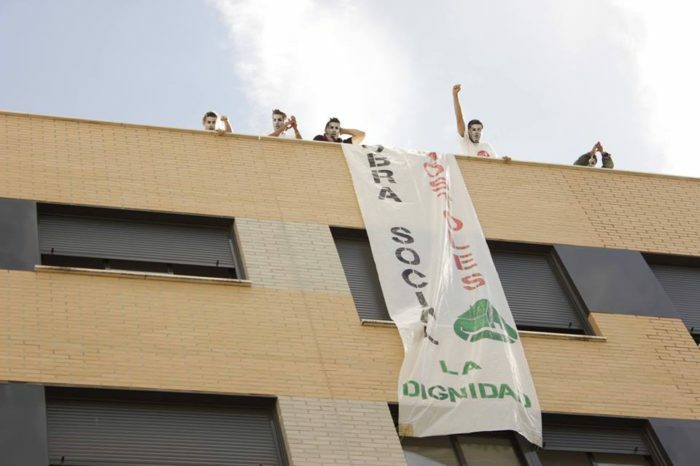 Housing activists from Stop Desahucios (Stop Evictions) in Mostoles took over the building in June 2014, and christened it “La Dignidad”. The building “La Dignidad” is part “La Obra Social” (Social Work), a nation-wide campaign initiated by the Plataforma de Afectados por la Hipoteca (PAH) which targets the hundreds of thousands of empty apartment buildings constructed during the Spanish housing bubble. The banks are the current owners of these buildings: they took over possession of the property from bankrupt developers who defaulted on their investment loans. The banks received huge government bailouts, while, at the same time, people were being evicted from their homes at unprecedented levels. The activists use these buildings, to relocate families and individuals with housing difficulties. According to the housing activists, if the banks belong to the public, then the houses do as well. These small, but steady acts of resistance challenge the logic of neoliberalism: small, large victories which can be shared and repeated in other locations. Comments closed — Trackback URI RSS 2.0 feed for these comments This entry (permalink) was posted on Saturday, September 10, 2016, at 9:12 am by admin. Filed in Film.